नील किन्नॉक विपक्ष में पार्टी के नेता, 1983–92. ↑ ब्रिवाती, ब्राएन; हेफ़रनैन, रिचर्ड (2000). The Labour Party: A Centenary History [लेबर पार्टी: एक शताब्दी का इतिहास]. बेसिंगस्टोक [u.a. ]: मैकमिलन [u.a.] आई॰ऍस॰बी॰ऍन॰ 9780312234584. 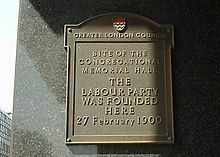 On 27 February 1900, the Labour Representation Committee was formed to campaign for the election of working class representatives to parliament. ↑ अ आ थोर्प, ऐन्ड्रयु (2008). A History of the British Labour Party [ब्रिटिश लेबर पार्टी का इतिहास] (३ संस्करण). मैकमिलन. पृ॰ 8. आई॰ऍस॰बी॰ऍन॰ 9781137114853. अभिगमन तिथि 2 जून 2015. ↑ "Over a quarter of a million could vote in Labour leadership contest". लेबर लिस्ट. 23 जून 2015. ↑ अ आ बैकर, रयॉन; जॉली, सेठ; पोल्क, जोनाथन. "Mapping Europe's party systems: which parties are the most right-wing and left-wing in Europe?". ''लंदन स्कूल ऑफ एकोनॉमिक्स'' / EUROPP – यूरोपियन पॉलिटिक्स & पॉलिसी. अभिगमन तिथि 26 मई 2015. ↑ अ आ गिडेन्स, एंथोनी (17 मई 2010). "The rise and fall of New Labour" [नए लेबर का उत्थान और पतन]. द न्यू स्टेट्समेन. अभिगमन तिथि २७ जुलाई २०१५. ↑ अ आ Pautz, Hartwig (2012). Think-Tanks, Social Democracy and Social Policy. हाउंडमिल्स, बेसिंगस्टोक, हैंपशायर: पालग्रेव मैक्मिलन. पृ॰ 161. आई॰ऍस॰बी॰ऍन॰ 9780230368545. ↑ अ आ पीकॉक, माइक (8 मई 2015). "The European centre-left's quandary". र्युटर्स. अभिगमन तिथि 26 मई 2015. A crushing election defeat for Britain's Labour party has laid bare the dilemma facing Europe's centre-left. ↑ अ आ डैह्लग्रीन, विल (23 जुलाई 2014). "Britain's changing political spectrum". यूगॉव. अभिगमन तिथि 26 मई 2015. ↑ कोलोमर, जोसेफ एम. (2008). Comparative European Politics. रॉउटलेज़. पृ॰ 26-27. आई॰ऍस॰बी॰ऍन॰ 1134073542. ↑ मार्टिन डंटन. ""The Labour Party and Clause Four 1918–1995"". हिस्ट्री रिव्यु 1995. अभिगमन तिथि २७ जुलाई २०१५. ↑ जॉन रेन्टॉल (14 मार्च 1995). ""'Defining moment' as Blair wins backing for Clause IV"". द इंडिपेंडेंट. अभिगमन तिथि २७ जुलाई २०१५. ↑ "Labour Leadership Election 2010". लेबर पार्टी. अभिगमन तिथि २७ जुलाई २०१५. ↑ "How we work – How the party works" [हम और हमारा दल कैसे काम करता है..]. Labour.org.uk. अभिगमन तिथि २७ जुलाई २०१५. ↑ टुडोर जोन्स (1996). Remaking the Labour Party: From Gaitskell to Blair (अंग्रेज़ी में). लंदन: रॉउटलेज़. पृ॰ 107. ↑ "Labour Party Annual Conference Report" [लेबर पार्टी: वार्षिक सभा प्रतिवेदना] (अंग्रेज़ी में). 1931. पृ॰ 233. ↑ "The long and the short about Labour's red rose". द टेलिग्राफ. 26 जून 2001. अभिगमन तिथि २७ जुलाई २०१५. ↑ अ आ ग्रैडी, हेलेन (21 मार्च 2011). "Blue Labour: Party's radical answer to the Big Society?". बीबीसी. ↑ होगार्ट, सिमॉन (28 सितम्बर 2007). "Red Flag rises above a dodgy future". द गार्ज़ियन. अभिगमन तिथि 21 दिसंबर 2011. ↑ "Video: Ed Miliband sings The Red Flag and Jerusalem at the Labour Party Conference - Telegraph". Telegraph.co.uk. 29 सितम्बर 2011. ↑ "Anger over 'union debate limit'". बीबीसी. 19 सितम्बर 2007. अभिगमन तिथि २७ जुलाई २०१५. ↑ "Labour Party announces new senior team" [लेबर पार्टी ने नई वरिष्ठ टीम की घोषणा की।]. Labour.org.uk. 9 मार्च 2012. अभिगमन तिथि २७ जुलाई २०१५. ↑ सिद्दीकी, हरून (15 मार्च 2012). "Politics live blog: Thursday 15 March". द गार्ज़ियन. London. ↑ वेबैक मशीन पर लेबर दल सदस्यता प्रपत्र., लगभग 1999ई०, इंटरनेट आर्काइव के ज़रिए। अभिगमन तिथि: 31 मार्च 2007। "उत्तरी आयरलैंड के निवासी सदस्यता पाने के योग्य नहीं हैं।"
↑ "Labour NI ban overturned". बीबीसी समाचार. 1 अक्टूबर 2003. अभिगमन तिथि 31 मई 2013. ↑ "RMT 'breached' Labour party rules". 27 जनवरी 2004. अभिगमन तिथि २१ जुलाई २०१५. ↑ "Labour's link to unions in danger". बीबीसी. 16 June 2004. ↑ डंटन, जिम (17 जून 2009). "Unison: "no more blank cheques' for Labour" [लेबर के लिए अब कोई रिक्त चेक ज़ारी नहीं होगा-यूनिसन]. लोकल गवर्नमेंट क्रॉनिकल. अभिगमन तिथि २१ जुलाई २०१५. ↑ वर्नर कोवैल्स्की (1985). Geschichte der sozialistischen arbeiter-internationale 1923 – 19. बर्लिन: Dt. Verl. d. Wissenschaften. ↑ ब्लैक, ऐन (6 फरवरी 2013). "Report from Labour's January executive". Leftfutures.org. अभिगमन तिथि २७ जुलाई २०१५. ↑ "Progressive Alliance: Sozialdemokraten gründen weltweites Netzwerk – SPIEGEL ONLINE" (जर्मन में). Spiegel.de. अभिगमन तिथि २७ जुलाई २०१५. ↑ "Vorwurf: SPD "spaltet die Linken"" (जर्मन में). Kurier.At. 22 मई 2013. अभिगमन तिथि २७ जुलाई २०१५. ↑ "Vorwärts in eine ungewisse Zukunft – 150 Jahre SPD – Politik – Nachrichten – morgenweb" (जर्मन में). Morgenweb.de. 22 मई 2013. अभिगमन तिथि २७ जुलाई २०१५. ↑ विन्टुअर, पैट्रिक; स्याल, राजीव; पेराउदिन, फ्रांसेस (30 मार्च 2015). "EU referendum will play havoc with business, Ed Miliband warns". द गार्ज़ियन. अभिगमन तिथि 4 अप्रैल 2015. ↑ "TUC History Timeline". लंदन मेट्रोपोलिटन विश्वविद्मालय. अभिगमन तिथि २१ जुलाई २०१५. ↑ मार्टिन क्रिक (1994). The History of the Social-Democratic Federation. ऑक्सफ़ोर्ड विश्वविद्मालय प्रेस. आई॰ऍस॰बी॰ऍन॰ 9781853310911. ↑ "Collection highlights". पीपल्स हिस्ट्री संग्रहालय. अभिगमन तिथि 2 जून 2015. ↑ अ आ इ ई Thorpe, Andrew (2001). A History Of The British Labour Party [ब्रिटिश लेबर पार्टी का इतिहास]. पालग्रेव. आई॰ऍस॰बी॰ऍन॰ 0-333-92908-x |isbn= के मान की जाँच करें: invalid character (मदद). ↑ "Collection Highlights, 1906 Labour Party minutes". पीपल्स हिस्ट्री संग्रहालय. ↑ "The Labour Party Archive Catalogue & Description". पीपल्स हिस्ट्री संग्रहालय. ↑ रोजमेरी रीस (2003). Britain, 1890–1939 [ब्रिटेन, १८९०-१९३९]. पृ॰ 200. ↑ "Red Clydeside: The Communist Party and the Labour government [booklet cover] / Communist Party of Great Britain, 1924". ग्लासगो डिजिटल पुस्तकालय. अभिगमन तिथि २२ जुलाई २०१५. ↑ "1945: Churchill loses general election" [१९४५: आम चुनावों में चर्चिल हारे।]. बीबीसी. 26 जुलाई 1945. अभिगमन तिथि 22 फरवरी 2009. ↑ क्लॉर्क, सर ज़ॉर्ज (1987). Illustrated History Of Great Britain [ग्रेट ब्रिटेन का व्याख्यातमक इतिहास]. ऑक्टोपस बुक्स. ↑ "1983: Thatcher wins landslide victory". बीबीसी समाचार. 9 जून 1983. अभिगमन तिथि २७ जुलाई २०१५. ↑ "1992: Tories win again against odds". बीबीसी समाचार. 5 अप्रैल 2005. ↑ "1997: Labour landslide ends Tory rule". बीबीसी समाचार. 15 अप्रैल 2005. ↑ "new Labour because Britain deserves better". लेबर पार्टी का चुनावी घोषणापत्र. ↑ नाइज़ेल. "300 gains brought by labour government" (PDF). अभिगमन तिथि २७ जुलाई २०१५. ↑ "Reforms – ISSA". Issa.int. 7 जनवरी 2004. अभिगमन तिथि २७ जुलाई २०१५. ↑ "Tackling poverty – a progress report" (PDF). कार्मिक और पेंसन मंत्रालय. मार्च २००६. अभिगमन तिथि २७ जुलाई २०१५. ↑ "UK: numbers in low income – The Poverty Site". Poverty.org.uk. अभिगमन तिथि २७ जुलाई २०१५. ↑ "Work, Family, Health, and Well-Being: What We Know and Don't Know about Outcomes for Children" (PDF). अभिगमन तिथि २७ जुलाई २०१५. ↑ मिचिंसन, जॉन; पोलार्ड, जस्टिन; ओल्डफ़ील्ड, मॉली; मर्रे, एंडी (26 दिसम्बर 2009). "QI: Our Quite Interesting Quiz of the Decade, compiled by the elves from the TV show". द डेली टेलीग्राफ. लंदन. अभिगमन तिथि २७ जुलाई २०१५. ↑ "European Opposition To Iraq War Grows | Current Affairs". डच वेल्ले. 13 जनवरी 2003. अभिगमन तिथि २७ जुलाई २०१५. ↑ मैक्स्किल, इवेन; बोर्ज़र, जुलिअन (१६ सितम्बर २००४). "Iraq war was illegal and breached UN charter, says Annan" [कोफी अन्नान ने इराक युद्ध को गैरकानूनी और संयुक्त राष्ट्र के चरित्र के विरुद्ध बताया।]. द गार्ज़ियन. अभिगमन तिथि २७ जुलाई २०१५. ↑ बेनहोल्ड, कैट्रिन (28 अगस्त 2004). "Unlikely alliance built on opposition to Iraq war now raises questions". न्यूयॉर्क टाइम्स. अभिगमन तिथि २७ जुलाई २०१५. ↑ "Harman made acting Labour leader". बीबीसी. 11 मई 2010. ↑ अ आ "At-a-glance: Elections 2012". Bbc.co.uk. 4 मई 2012. अभिगमन तिथि २४ जुलाई २०१५. ↑ "Vote 2012: Welsh Labour's best council results since 1996". बीबीसी. 4 मई 2012. अभिगमन तिथि २४ जुलाई २०१५. ↑ "Labour wins overall majority on Glasgow City Council". बीबीसी. 4 मई 2012. अभिगमन तिथि २४ जुलाई २०१५. ↑ "By-elections: Labour takes Corby from Conservatives". बीबीसी. 16 नवम्बर 2012. अभिगमन तिथि २४ जुलाई २०१५. ↑ "32,000 'surge' in Labour party membership". द इंडिपेंडेंट. लंदन. 13 सितम्बर 2010. ↑ "Is this Labour's New Year strategy memo?". लेबर लिस्ट. ↑ "An indelicate question: Labour Party membership – stalled locally, nationally?". Petergkenyon.typepad.com. 5 जनवरी 2012. अभिगमन तिथि २४ जुलाई २०१५. ↑ "European voters now calling for less EU". द यूके न्यूज़. अभिगमन तिथि २४ जुलाई २०१५. ↑ "Vote 2014 – Election Results for Councils in England". "बीबीसी". अभिगमन तिथि २४ जुलाई २०१५. ↑ विन्टुअर, पैट्रिक (21 अप्रैल 2011). "Miliband Speech To Engage With Blue Labour Ideals". द गार्ज़ियन. लंदन. ↑ गुडहार्ट, डेविड (20 March 2011). "Labour can have its own coalition too". द इंडिपेंडेंट. London. ↑ बैरेट, मैथ्यु (20 मई 2011). "Ten Things You Need to Know About Blue Labour". लेफ़्टवाच. ↑ "A nation of shoppers". द इकोनॉमिस्ट. 19 मई 2011. ↑ स्कोर, स्टीव (30 मार्च 2011). "Review: Blue Labour". द सोस्लिस्ट. ↑ पैट्रिक विन्टुअर, राजनीतिक संपादक (17 मई 2011). "Ed Miliband endorses 'Blue Labour' thinking". द गार्ज़ियन. अभिगमन तिथि २४ जुलाई २०१५. ↑ "Exclusive: the end of Blue Labour". न्यूस्टेटमैन.कॉम. अभिगमन तिथि २४ जुलाई २०१५. ↑ मिलिबैंड, एड (25 मई 2012). "Building a responsible capitalism". जंक्चर (IPPR). मूल से 31 मई 2012 को पुरालेखित. अभिगमन तिथि २४ जुलाई २०१५. ↑ "Ed Miliband: Surcharge culture is fleecing customers". बीबीसी. 19 जनवरी 2012. अभिगमन तिथि २४ जुलाई २०१५. ↑ "Ed Miliband's Banking Reform Speech: The Full Details"". न्यू स्टेट्समैन. अभिगमन तिथि २४ जुलाई २०१५. ↑ "Ed Miliband lays down living wage challenge". द गार्ज़ियन. 27 अप्रैल 2013. अभिगमन तिथि २४ जुलाई २०१५. ↑ "Is Osborne right that a smaller state means a richer UK?". बीबीसी. अभिगमन तिथि २४ जुलाई २०१५. 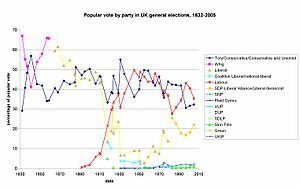 ↑ "UK Election: Telling the story using numbers". आइरिश टाइम्स. 8 मई 2015. अभिगमन तिथि २४ जुलाई २०१५. ↑ "Election 2015 results MAPPED: 2015 full list". द टेलीग्राफ. 8 मई 2015. अभिगमन तिथि २४ जुलाई २०१५. ↑ अ आ "Labour election results: Ed Miliband resigns as leader". बीबीसी. 8 मई 2015. अभिगमन तिथि २४ जुलाई २०१५. ↑ "General Election 2015: The campaign for leaders to dodge brickbats and 'address' Scotland". द इंडिपेंडेंट. 1 मई 2015. अभिगमन तिथि २४ जुलाई २०१५. ↑ "Scotland election 2015 results: SNP landslide amid almost total Labour wipeout - as it happened". द टेलीग्राफ. 8 मई 2015. अभिगमन तिथि २४ जुलाई २०१५. ↑ "How many seats did Labour win?". द इंडिपेंडेंट. 8 मई 2015. अभिगमन तिथि २४ जुलाई २०१५. ↑ अ आ "Labour International Rules 2008" (PDF). द लेबर पार्टी. २००८. अभिगमन तिथि २७ जुलाई २०१५. When the party is in opposition and the party leader, for whatever reason, becomes permanently unavailable, the deputy leader shall automatically become party leader on a pro-tem basis. केलिहेर, डायर्मेड (2014). "Solidarity and Sexuality: Lesbians and Gays Support the Miners 1984–5". हिस्ट्री वर्कशॉप जर्नल. ऑक्सफ़ोर्ड जर्नल्स. 77 (1): 240–262. डीओआइ:10.1093/hwj/dbt012.